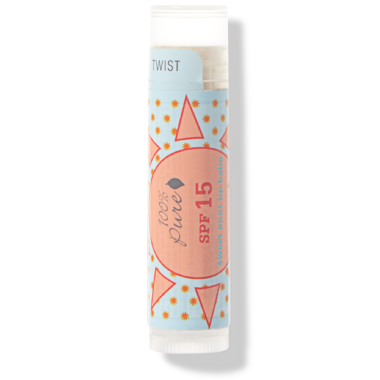 The 100% Pure Sweet Mint Lip Balm features SPF 15, non-nano, no white cast, UVA & UVB protection. It helps prevent sunburn if used as directed with other sun protection measures and to decrease the risk of skin cancer and early skin aging caused by the sun. Directions: Apply liberally 15 minutes before sun exposure. Reapply: after 40 minutes of swimming or sweating, immediately after towel drying, or at least every 2 hours. Can be worn alone or as a base for your normal lip color for added sun protection. For Whom: For those looking for a multi-tasking lip balm offering both intense moisture and sun protection for lips. Inactive Ingredients: Cera Alba (Beeswax)-Fair Trade Certified™, Theobroma Cacao (Cocoa) Seed Butter, Cocos Nucifera (Coconut) Oil, Ricinus Communis (Castor) Seed Oil, Vanilla Flavor, Helianthus Annuus (Sunflower) Seed Oil, Persea Gratissima (Avocado) Oil, Mixed Tocopherols (Vitamin E), Mentha Piperita (Peppermint) Essential Oil, Calophyllum Inophyllum (Tamanu) Oil, Hippophae Rhamnoides (Sea Buckthorn) Fruit Oil, Calendula Officinalis (Calendula) Extract.